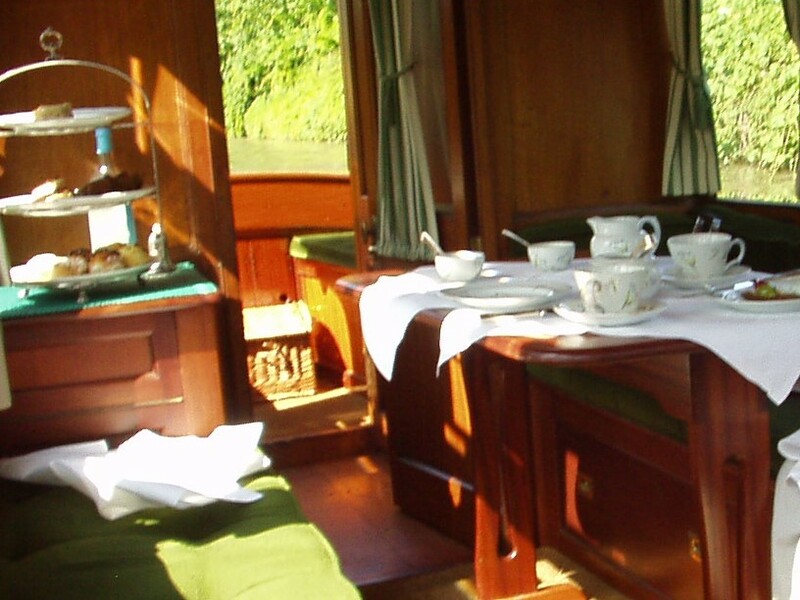 As you can see, afternoon tea on the river launch is ready, so please do join me. Having had the joy of staying with one of my American friends some years ago, I discovered how important the sense of ‘tea time’ remains in the USA. So, in reminiscence of a wonderful vacation trip to visit a dear friend, I have written the ‘Tea with Daisy’ page. Do enjoy, and please, if you want to create the ambiance of afternoon tea, do use a table cloth, china cups and a teapot if you can, they improve the brew and sense of occasion. If you have a stand to serve from like the one in the picture, your afternoon tea will make your friends sigh. Choose your blend with care and attention to your personal palette and those of your guests. I know many of you understand all about the brewing of a good cup of tea, my friend certainly does, but I thought I’d add a bit here about making tea, just in case one or two of you might like it. Indian: or black tea as it is known makes a pleasant and aromatic brew, in my opinion it is suitable for those who like or need sugar in there drinks. This is the tea you usually find in tea bags, it is also served at afternoon tea. Try brewing with loose tea rather than bags. You can then use a tea strainer or you can have fun reading the tea leaves when the drink is finished. My grandfather was an expert at reading tea leaves, sadly I didn’t inherit the skill from him. Earl Grey, is a preference of another dear friend of mine in the USA. I think this brew is best served with lemon, as its delicate flavor is smothered by milk and sugar. China tea: The Chinese tea ceremony is very different from English afternoon tea. You can use China tea but I would suggest you test flavors first. Green tea: something I drink on occasion, I serve this with no sugar or any other accompaniment. I enjoy its charge to the senses. Herbal teas: these are not usually served at afternoon tea, but they are enjoyable none the less. I like blackcurrant tea, ginger tea and I think there is something very soothing about chamomile tea. Many people carry a recipe from their family for mint tea; it too has a soothing quality. Whichever tea you prefer, warm your pot with a swirl of boiling water, pour this out before you add your tea leaves, one spoon in the pot for each guest up until four I would say, and one for the pot. The size of the pot does matter here, tiny pots need no more than two spoons, larger pots obviously take more. When you have added your tea, pour on fresh boiling water, put on the pot lid and give the brew three or four minutes for the tea to steep. This is important otherwise the first cups poured might be very weak. Some people stir but you don’t always need to do so. My family heritage is I believe from the working class of people who moved from the countryside into the industrial towns in the eighteenth century, definitely they were among those who couldn’t afford to buy tea. I believe what they may have bought when they could were the once or twice used tea leaves on offer cheap, often sold by servants of the wealthy as a perk of their job. My family stirred to get the best from their pot. I have debated this with friends and have never felt entirely sure. My family always add milk first to the cup before pouring, a sign none of them were wealthy enough to belong to the elite whose cups didn’t pop with the addition of a very hot brew. Those individuals known as ‘milk first’, were once seen as coming from the lower classes in the times when such things made a difference. People you may know who add milk to the cup after its poured display a heritage of wealth. Their cups would have been of the finest quality and not broken with a hot beverage. Such is the range of myths and the importance of tea in England I have also seen the above logic reversed in tea literature. The earliest and therefore most expensive tea bowls were very delicate and boiling hot tea could have shattered them so, some say milk was added to prevent the dainty china shattering, other sources say it was all down to taste preference. I believe people in the earliest days would have taken tea with no milk or lemon and sugar was sucked in a lump as a side entertainment from the tea. Are you sighing here and longing for a cup of tea? So am I, and to be honest, as long as you make your tea with love and care and offer it to your guests that way, they will enjoy it and remember you as a wonderful friend. As an aside from all the above and to absolve those who are always in a hurry: I also know people who throw a tea bag in a mug, pour on hot water and add milk, stir and hope for the best. All I can say is take the tea bag out before you hand over the mug to the important person in your life, and always offer sugar. Please do not mistake High Tea for Afternoon Tea. High tea which you may still find offered in some hotels and guest houses in the UK is a major meal. Afternoon tea is a delicious assortment of nibbles meant to soothe any appetite longings between lunch and dinner. Afternoon tea, in historical terms, is usually the preserve of ladies; invited gentlemen can attend but must be on their best behavior. As a hostess you can show off your most precious china, as a guest you can gossip to your heart’s content and plead for recipes of your favorite nibbles. Afternoon tea once was, and remains for many, a great deal of fun. A hostess at the very earliest tea parties served daintily cut bread and butter to her guests. I think the reason for this was the blandness of the bread and butter had a mellowing effect on the taste of the brew. I believe this is why milk began to be added to tea, but I could be wrong. If you wish to serve bread and butter, do get the very best white bread you can, not the stuff sold in plastic wrappers. Slice the bread as thin as you can and keep it cool but not in the fridge. Spread you bread with butter, not the other unmentionable stuff, it has to be butter. Aim for a thin layer so your guests don’t gag. Cut off the crusts from your bread and cut the slices into four neat triangles. I usually do this after I’ve buttered the bread it makes it easier. Place your buttered bread on a pretty plate in elegant rows. I always think a sprig of parsley looks pretty with the bread, but I love parsley. You can use brown bread as well as white if you chose to do so. Bread rolls: these are a semi sweet bread usually shaped in very small designs to look pretty on the plate. They can be set out buttered or have a filling if you wish. Use bread as in bread and butter, spread a small layer of the filling of your choice from these below, or make up your own. Never overfill, you don’t want your guests dripping filling or embarrassed as a stray dollop ruins their tea dress. Keep your sandwiches cool before serving but never serve chilled. Cucumber: Sounds easy? This must be English type of cucumber. Cut your cucumber into a manageable lump, peel it completely and slice as thin as possible. If you are brave you can use a kitchen mandolin to do this. Place a thin layer of cucumber slices on your buttered bread, top with the other slice, cut off crusts and cut into triangles. If this is your first tea party with several friends make lots of these they disappear fast. Potted meat and fish are fillings suggested by Mrs. Beeton. Finely mixed egg and cress. I’m sure all you creative individuals can think of many other fillings you’d like to try. Muffins: these can be served at afternoon tea, they were certainly popular in the 1920’s, serve warm, sliced in half and spread with butter. Now all this savory stuff is all very well, but the true heart of afternoon tea lies in cake, lots of lovely, luscious and beautiful cake. Maderia cake, also known as pound cake. A little milk can be added if the mixture is too stiff. This is a tea time favorite and is easy to remember and make. Simply mix everything together until you have a creamy smooth mixture. Place in a lined and buttered tin. Cook in a moderate oven 180C until the top is golden. Remove from the tin and leave to cool on a wire rack. When cool slice and cut the slices in half to serve. Coconut Cake made my gran’s way. Place in a buttered and lined cake tin for a large cake, or for small individual cakes place in individual bun or cake tins. Cook at 16 C until the top is golden, about an hour for a large cake. Test the cake is cooked all the way through by putting a skewer in the middle if it comes out clean your large cake is cooked perfectly. Smaller cakes will cook quicker and are easier to tell if they are done. A few blanched almonds to decorate. One on each biscuit. Heat oven to 180 C / Gas 5. Grease two baking trays. Mix all of the dry ingredients together except for the blanched almonds (for topping). Rub in margarine. Add extract and mould together with your hands. Roll out thinly and cut into shape, usually circular but you can try other shapes if you wish, and place a blanched almond on the top. If you’d like to add your favorite cake recipe do send it along and I’ll place it on the Tea with Daisy page. I posted this on my FB page, and bragged! LOL this is the first time I saw this… how did I miss it? you really must post links for things on my page.